It will also remove the quick forward button next to media messages. 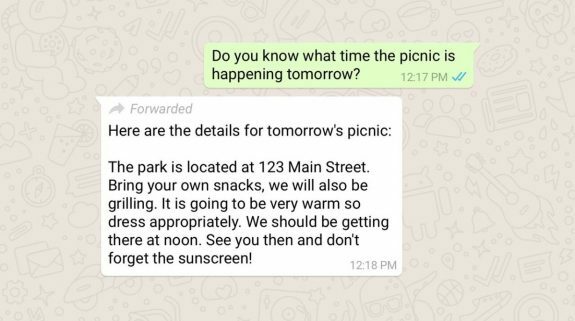 WhatsApp recently started labelling messages as ‘Forwarded’ to indicate that they were not created by the sender. To check the spread of misinformation though WhatsApp forwards, the Facebook-owned messaging platform is testing another new feature. It’s going to limit the number of messages and media you can forward. In India, WhatsApp will test a lower limit — five chats at once — and also remove the quick forward button next to media messages. “Today, we’re launching a test to limit forwarding that will apply to everyone using WhatsApp,” it said. For India, where it acknowledges that people forward more messages, photos, and videos than any other country in the world, the messaging platform will test a lower limit of five chats at once, and remove the quick forward button next to media messages. This will mean if a message containing media is forwarded five times from the same account, WhatsApp will disable the option to forward it further. “We built WhatsApp as a private messaging app – a simple, secure, and reliable way to communicate with friends and family. And as we’ve added new features, we’ve been careful to try and keep that feeling of intimacy, which people say they love,” WhatsApp said in a blog post. It said the changes would continuously evaluated to keep WhatsApp the way it was designed to be — a private messaging app. WhatsApp has over 250 million users in India, the messenger app’s biggest market. It is also the country that has witnessed a spate of mob violence and lynching reports due to misinformation spread through WhatsApp forwards. WhatsApp has been facing increasing scrutiny due to this, and was last month asked by the government to explain its stand. In a letter to the Ministry of Electronics and Information Technology (MeITY), the company had written that it was horrified by the reports of violence in the country, and soon announced new steps to curb the spread of misinformation. It recently introduced a feature that enabled users to know if a WhatsApp message received by them is an original post or just a forward. It has started labelling messages as ‘Forwarded’ to indicate that the message was not created by the sender. WhatsApp also took out advertisement campaigns in Indian newspapers on the steps taken to fight the spread of fake news.